My head is spinning right now. We're only 3 books into the series and I'm getting whiplash. I love Kiyo, I hate Kiyo, I love Kiyo again, I hate Kiyo again. I love Dorian, I don't trust Dorian. Rinse, repeat.Holy crap, the last few chapters took me off guard. I did not see what was coming with Kiyo at all. I guess I should have at least sort of thought that maybe things could have gone down the way they did, but no...not really because of his previous reaction to another similar situation.It seems like people either loved book 3 as their favorite in the series so far, or were pissed at some of the things that transpired. Eugenie's indecision also appears to be an annoyance for some, but I can kind of understand why she flip flops so much, given that it's hard to really know who to trust. Sure, she could stay single, but then people would cry if they didn't get their hookup scenes at least somewhere in the book.I'm okay with how it's shaking down so far. This book had quite the interesting power plays going on, and it was nice to see Jasmine soften a bit and not bent on being the "kid sister wanting to take over the world" for once.It's going to be a very long wait now to find out what happens in the battle for control of the Otherworld's magical lands. 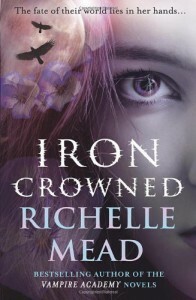 Darn you Richelle Mead - I'm going to be impatiently waiting for more. You do this to me with every single series!